Allow your users to create a profile, or disable profiles entirely. Create multiple rooms on your chat room! You can set an icon and a topic for each individual room. Ban I.P addresses from your website with a few clicks! Allow your users to insert smilies, new smilies can be added simply by adding them to the folder! Convert text to a hyperlink automatically, or disable this feature entirely! Users will see their messages as pending, creating an ultra fast feeling chat system! Users can disable auto-scrolling to see the earliest messages. Keep your users entertained by adding flash games to your chat room! Profiles can now be embedded in the chat window. Disable registration completely and allow logins only! 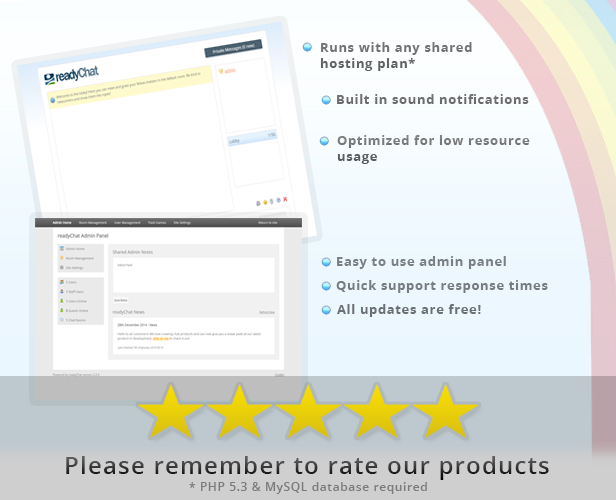 Allow guests to chat on your website! Password protect your chat rooms. Chat privately with your friends! All future updates for readyChat will be free to customers! Great chat! I wish writers could use this one, so I could easily ask prices of EssayforMe papers. It's such a headache to use Whatsapp. This chat now has became more optimized, smoother and enjoyable for both the administrator and the user as well! Your post is really great and it seems to me that you need to give more. I like getting the information that can help me to improve my work. If, you are providing web chat service on your website, then your customers don’t have to send emails, or give you phone calls for discussing their needs and requirements, so it will save the time of both the parties.